As of Oct 24, 2018 funding for ~1MW has been committed, pending approval. Remaining funds are available for PPAs up to ~250kW. Applications will be accepted on a first-come, first-served basis until all funds are committed. The Solar Power Purchase Program (SP3) incentivizes the installation of new, local solar systems on commercial customer facilities. The basis of the SP3 is a fixed-price (non- escalating), 20-year power purchase agreement (PPA) between Utilities and system owners for solar generation located on commercial facilities. Commercial customers may enter agreements with solar developers for installation of the systems, which may include financing, lease-purchase and rooftop property leasing. The energy output of the solar system goes directly to Utilities’ electric grid “in front of the billing meter” and system owners are paid based on their PPA. The agreement does not alter the customer’s electric bill. 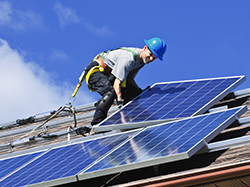 This arrangement is commonly known within the solar industry as a feed-in-tariff or “FIT” model. The PPAs also convey the Renewable Energy Credits (RECs)—the right to claim the renewable energy attributes of a project—to Utilities to reach community clean energy goals. The solar projects from this program will help Utilities’ meet its renewable energy goal for 2020. In addition, the locally produced renewable energy supports the community’s Climate Action Plan and Energy Policy greenhouse gas reduction goals while supporting local investment. City Council authorized funding for the program in November 2016, which is capped at $282,500/ year. For more information, contact Sr. Energy Services Engineer Rhonda Gatzke at 970-416-2312 or c3AzQXBwbGljYXRpb25AZmNnb3YuY29t.